Seeing orangutans, either in the wild or in sanctuaries, is an experience that travellers all over the world seek. They often rough it in the wilderness and endure uncomfortable travel for just a glimpse of these magnificent and endangered creatures. With a luxury yacht charter, you can see the orangutans of Indonesia in their natural jungle habitat at your leisure, before returning to the comfort of your superyacht. 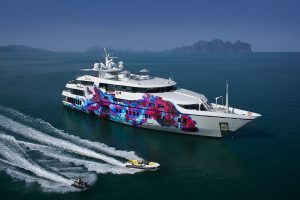 Because Borneo is so off the beaten track and often lacks the glamorous resorts and luxuries of other destinations, a superyacht charter makes perfect sense for someone wanting to experience the wonder of this wild and rugged place without having to go without the finer things in life. With a Borneo yacht charter, your luxurious ‘hotel’ floats with you, complete with private chef, captain and crew, who ensure that you receive 7-star service at every moment of your trip. The islands of Borneo and Sumatra are the only places on earth where you can see orangutans in their natural habitat, with wild, incredible Borneo providing an unforgettable immersive wildlife experience. Borneo is split over three countries, with the Malaysian states of Sabah and Sarawak and the tiny nation of Brunei in the north, and the vast Indonesian state of Kalimantan in the south. While there are multiple locations to see wild orangutans across Borneo, the Tanjung Puting National Park in Indonesian Kalimantan, is the best place to spot them in this region. Here a wildlife yacht charter can be effortlessly combined with a cruise through the Komodo National Park or the Raja Ampat region, for exceptional diving and more exploration in pristine nature. The Tanjung Puting National Park in Kalimantan is not only one of nature’s wonders, but also one of the most important sanctuaries in the world. With its unspoiled environment, offering the most mesmerising views of the Milky Way, this diverse and protected tropical heath lends itself perfectly to the orangutan. With over 5,000 wild orangutans calling the Tanjung Puting National Park home, Dr Birute Mary Galkidas founded the pioneering conservation Camp Leakey to provide the vital study of these great apes in their natural habitat, in order to protect them for the future. Named after Dr Galkidas’ mentor, the legendary paleoanthropologist, Louis Leakey, the camp is located deep in the jungle on the banks of the Sekonyer River. Together with Dian Fossey, who studied the gorillas, and Jane Goodall, who studied chimpanzees, Dr Galkidas, a most prestigious primatologist, offers scientists and visitors the chance to experience these gentle creatures like never before. Your captain will navigate as close as possible to the entrance of the park, before transferring you to a river boat for a journey up the jungle waterway. You’ll hear proboscis monkeys and gibbons chattering in the canopy and see traditional Dayan villages on the banks. Above all, you’ll be keeping your eyes peeled for that trademark orange fur and dark eyes of the orangutan, which can sometimes be spotted on the jetty on arrival at Camp Leakey. Your captain can organize a private tour of the camp with Dr Galkidas herself before you venture into the jungle with an experienced guide. Ever-alert for orangutans swinging from the trees, your guide will take you deep into the forest, teaching you how to listen out for the approach of orangutans and enabling you to observe their behaviour and interactions. Being in such proximity to these fascinating primates is a life experience second to none and you may even be treated to the sight of youngsters playing together or mothers nurturing their babies. Along your trails, don’t forget to look out for the National Park’s other inhabitants: clouded leopards, civets Malaysian sun bears, deer and the wild cattle known as banteng. They share the park with over 230 species of birds and colourful butterflies. As Camp Leakey is located a fair distance from the coast, you may decide to stay in the rainforest overnight, perhaps on the traditional klotok boats, where you will sleep on deck under the stars, listening to the call of the jungle and taking in the tropical light show that comes courtesy of the thousands of fireflies lining the river banks after dusk. It may not be a night on a superyacht, but it is a truly unforgettable adventure nonetheless – there’s a touch of Amazonian exploration to this primeval place! 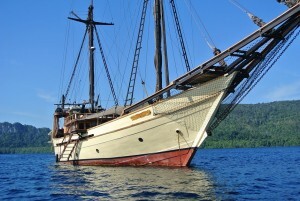 Chartering a yacht in the Indonesian state of Kalimantan provides an exceptional opportunity to get up close to the orangutans of Borneo while experiencing the pristine beauty and marine life of the Komodo National Park or the Raja Ampat region. 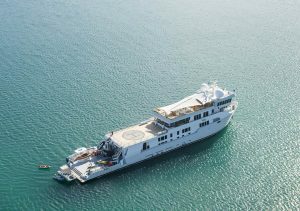 Far off the conventional yachting trail, this charter destination is unlike anywhere else on earth. Speak to your yacht broker to organize this ultra-bespoke experience.